Welcome to my blog for my first challenge submittal for the Sunday Stamps Challenges. 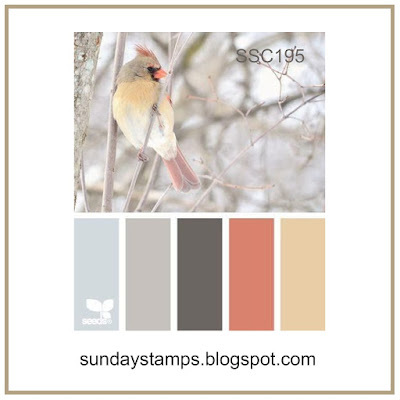 The challenge is to use at least 3 of the colors shown below plus one neutral from any stamp company. I choose to use all of the colors using Stampin' Up! products: Balmy Blue (stamped off to lighten), Gray Granite, Cajun Craze, So Saffron and Early Espresso. This was so fun to stamp the background with the new "Bloom by Bloom" set from the 2019 Occasions Catalog, I made 5 cards in total! The colors and paper created reminded me of fabric from years ago so I went with the "Free Cake" stamp set which has "Retro" sentiments. My last card use the "Sunny Days" stamp set with a white heat-embossed sentiment. This stamp set was so much fun to play with, especially in these colors!